In order to avoid the worst impacts, greenhouse gas emissions must be reduced. 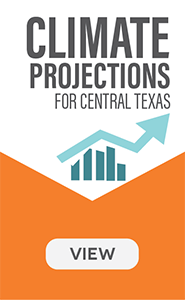 What does that mean for Austin and how can each of us make a difference? Greenhouse gases in the atmosphere trap and hold heat at the Earth’s surface. Carbon-based energy and fuel produce greenhouse gases. These primarily come from energy, transportation, landfills, and materials production and transport. What does Austin’s carbon footprint look like? 53% of greenhouse gas emissions come from energy, 36% from transportation, 5% from materials and waste management, and 6% from industrial processes, for a total of 13.7 million metric tons of carbon dioxide-equivalent. This includes high temperature extremes, increased flooding, and more periods of drought, which would mean negative consequences for health, property, and affordability. 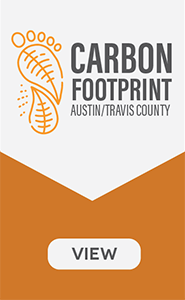 What does the typical Austinite’s carbon footprint look like? 50% comes from energy, 43% from transportation, and 7% from materials and waste management, for a total of 14 metric tons of carbon dioxide-equivalent. What can each person do to reduce their carbon footprint? Use less energy; walk, bike and ride the bus more; and keep as much out of the landfill as possible. The City of Austin is committed to reducing greenhouse gas emissions, as well as strategies to become more resilient and adaptive to climate change impacts.